North Cornwall District Council has launched a scheme in Bodmin to raise the profile of the town. The Pride and Place project which will run for three years, kicks off with a request to local people. The council wants to gather people's stories, memories and images of the town to be put into a history archive. David Atwell, from the town council admitted that turning the image of former county town Bodmin around could be a hefty task. 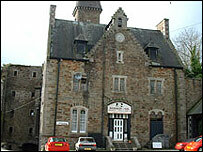 Bodmin still has the reputation of the only place in Cornwall with a former mental hospital and the place where the government built dozens of council estates in the 1970s. One of its attractions is its old jail where a mayor was once hanged. But it is also the former county town of Cornwall, the home town of the Duke of Cornwall Light Infantry and the home of the Bodmin and Wenford railway. Its moor is also, reputedly, the home of the Beast of Bodmin. A website promoting the project, calls it "The gateway to the moor and the heart of Cornwall." Mr Atwell said: "We are not looking at turning Bodmin into a tourist destination. "We are looking at what we think about Bodmin, why it's a great place to live and work in. "Its aim is to strengthen the town's unique landscape and cultural identity and to use creativity to heighten its sense of place." He added: "Bodmin is a very dynamic town. We are a very young population and forward thinking and the project aims to build on that."